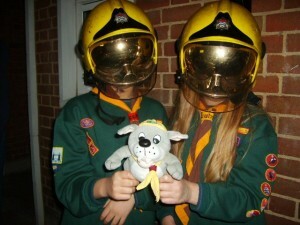 I was very lucky to be invited by 3rd Cheam Cubs , to join them when they visited Sutton Fire Station. 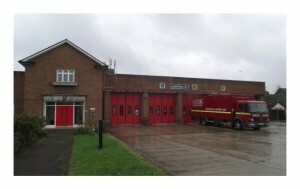 The firemen moved a fire engine into the training area and talked us through the equipment they used. I thought that I would get in a little closer to see what I could find. Here I am amongst the fire equipment. After it had been explained how the fire engine worked, the Cubs and I were allowed on board. The engines are huge and very powerful and the firemen explained that they could be called out to many types of emergency. 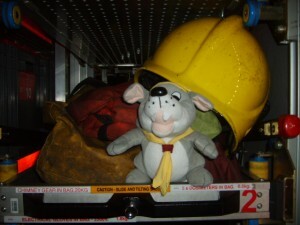 I can see everything from the front of this fire engine! The Cubs had a great time trying on the firemen’s helmets. These two Cubs look very scary in their firemen’s helmets and they held on tightly to me, to keep me out of danger. It is a bit big and heavy. 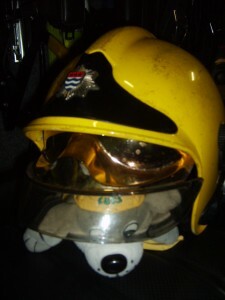 A fireman’s helmet is very heavy and I need some help to get out. The firemen, showed the Cubs how to use the water hoses. I decided not to take part in this, as I didn’t want to get my fur wet, but the Cubs enjoyed it. When we had finished outside, we were invited inside for a question and answer session. 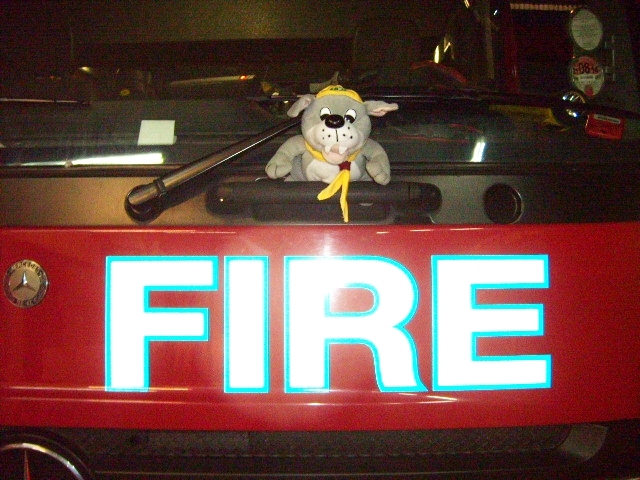 The firemen told us what happened when a ‘shout’ is received. (That is a 999 call to the fire station). We all had a great time and learned a lot. We thanked the firemen and went home to check on our own fire safety. 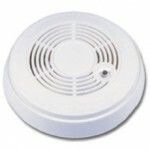 A smoke detector is a valuable piece of equipment in everybody’s home. 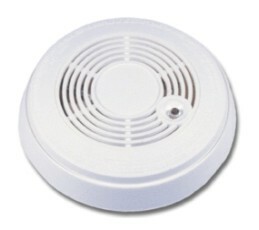 It needs checking regularly so you know it will work if you had a fire.